No longer are hoses and remote canisters required to get the benefits of a Penske Racing double adjustable drag shock. With 40+ clicks of compression and 40+ clicks of rebound, the new in-line 8975 shock absorber is quickly and easily tuned to accommodate any track or riding condition. 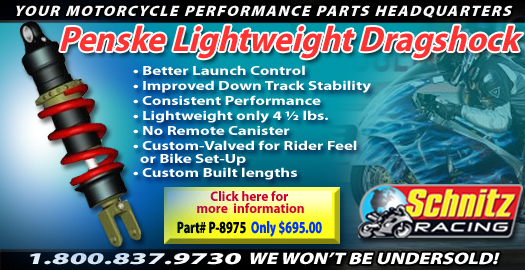 The In-Line Double Adjustable 8975 Series Shock is available for all major Drag Bikes and most custom applications. *Note – Because every shock is built to your specs, expect a 2-3 week delivery time.